Keepsake, Communion, Christening, Baptism bracelet for baby and child. Glamour and classic style combine in this handmade bracelet! Only the very best will do – and this special bracelet is a perfect choice. Hand strung by a stay-at-home mom in Brooklyn, NY. Sizing: We offer different sizes – please order according to child’s age and wrist size. Measure child’s wrist exactly and add a 1/4 to 1/2 inch to the circumference and order accordingly. For example, if child’s wrist measures 5 inches – order the MEDIUM+. All bracelets include approximately 1 inch of sterling silver extender chain, so your bracelet can grow with your child. A matching necklace is available as well. 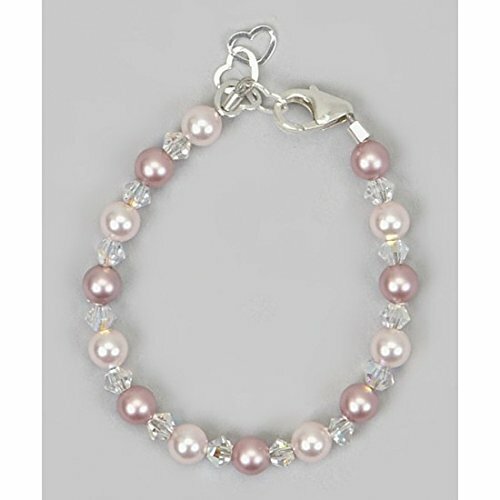 This bracelet would be perfect for any flower girl or junior bridesmaid! It’s also a beautiful memento for a baptism, christening, baby dedication, First Communion, confirmation. It is heirloom quality and will surely be cherished. Your child’s safety is paramount to us at Crystal Dream – therefore, we have our experts test each bracelet for safety prior to shipping. Each end of our work, strung on 49-strand wire, is triple-secured and beads are hand-selected for safety and quality. We do not recommend putting your child to sleep with a bracelet on, and bracelets are not intended for use as toys. This item is best cleaned with a dry cloth, or with a damp cloth. Not dishwasher-safe.